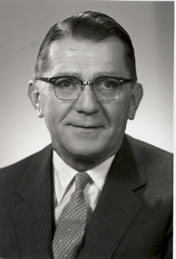 P. C. Lauinger, a long-time Tulsa business leader, headed the PennWell Corporation, publisher of Oil & Gas Journal and other trade magazines and business information services, from 1931 unti1 1970 and served as chairman emeritus until his death in 1988. Lauinger was born in Oil City, Pennsylvania and raised in Pittsburgh. He graduated from Georgetown University, joined the Oil & Gas Journal, and upon his father’s death became the third-generation president of the company.